the new salt: olive oil poached garlic, originally uploaded by aarn! +13th October, 2010+. peeled enough garlic to fill a pint container with raw cloves. placed the pint of cloves into a small sauce pan. poured olive oil over the cloves in the pan until fully-submerged. put the pan over a low flame and allowed to get up to a delicate simmer. continued at this temperature (probably about 200-degrees) until the cloves were tender enough that they could be easily pierced through by a cake tester or fork. removed the cloves in oil from heat, and allowed to cool (a little bit of browning is ok, ideally the browning would occur during carry-over cooking, after removed from heat...that gives the best result). transferred the cooled garlic to a pint container with a spoon, and poured the oil that the cloves were cooked in over the top until the container was full (discarding any brown bits in the bottom of the sauce pan). placed the covered container in the refrigerator until needed (edit: use within 2-3 days). this can also be done in the oven, for a more gentle poach. oven temperature can range from 200 to 325-degrees, cooking times vary. 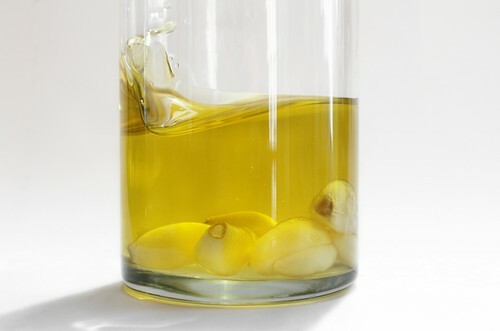 olive oil poached garlic is one of the most versatile ingredients to have in the fridge. the taste is slightly more mellow and the cloves can be consumed raw or in cooked food. there is also a nice sweet undertone and the oil is great for garnishing or dipping. a pint container of these usually disappear quickly. thanks for the heads-up. as i said in the edited portion of the post, i have made this recipe a dozen times or so, but i am not a food science expert. i called jeff potter, author of cooking for geeks and we agreed that i should adjust the post to say that if you are going to poach garlic cloves in olive oil, they should be eaten within a few days to avoid any possible risk.